I’ve been very sick the past few days and I was hoping that using my Imagine would distract me from the pain. Low and behold, it did help!! I was having a blast with my new Imagine making a birthday card – for no one in particular. 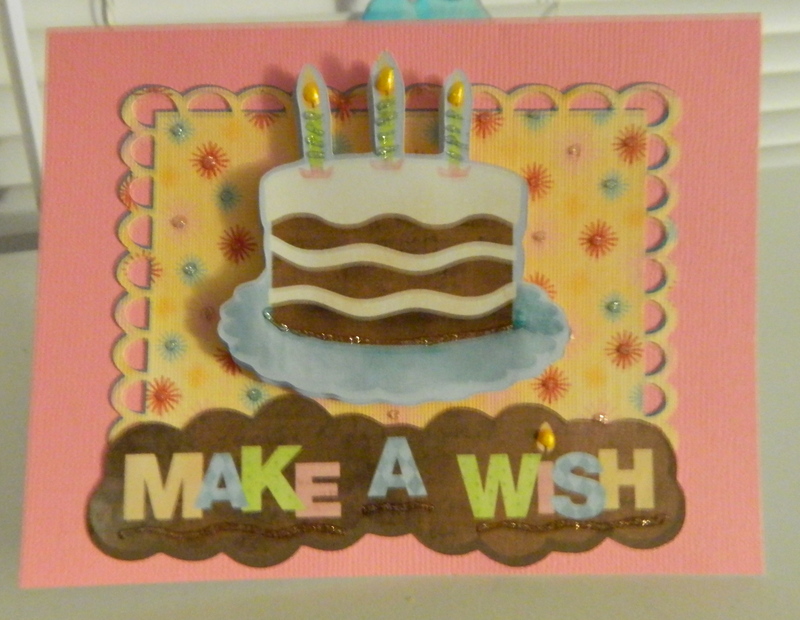 Here is the new card I made using my Circut Imagine with Imagine Art Cartridge Yummy and Cricut Cartridge Elegant Edges. I used Cricut Craft Room to design and print my items using the Imagine. For the Scallop2 Elegant Edge cut, I used one of the patterns from the Yummy Cartridge to print and fill. After assembly of the card, I got a little crazy with the Viva Decor. This entry was posted in Cricut - Yummy, Cricut Cartridges, Paper Crafts and tagged birthday, Cricut, Cricut Craft Room, cricut elegant edges, cricut imagine, cricut imagine yummy, Greeting card by tiannafonz. Bookmark the permalink.